In a perfect world, we would get all the nutrients and medication we needed from the food we ate. However, our diets and the foods available to us have changed in the past century, so that eating healthily can be a challenge. Most of us have a spice rack filled with seasonings we grab in a hurry, but what do we know about these ancient herbs and their medicinal powers? Understanding the importance of adding oregano or basil to your spaghetti sauce, not as flavor but as a digestive aid is just one of the keys to turning your kitchen into the pharmacy it was meant to be. Kelly M. Shattuck, a Certified Herbalist based in North Carolina, says before health food stores made specific herbs such as valerian root readily available for medicinal healing, individuals relied on their culinary herbs to play a very important pharmaceutical role. As a modern society we have been â€˜programmedâ€ to seek medical relief from the use of pharmaceuticals, be it prescription or over-the-counter. This is somewhat understandable given the system we operate in today and its busy lifestyle filled with speedy shortcuts. We forget that our grand parents and ancestors had discovered countless natural home remedies for all types of ailments, many of which have not been passed down to current generations. The following home remedy is one for which many are inflicted, an upset stomach or stomach pain. Rather than reaching for a pharmaceutical, why not first try thinking about the possible cause (a particular food sensitivity, etcâ€¦) and second why not try a natural home remedy such as this one, which sometimes works better than a pharmaceutical! Many of my friends and acquaintances are aware that I am a firm believer in using natural products over chemical and pharmaceutical substitutes. Recently, I was visiting a friend and as usual our topic of conversation centered upon preparedness and possible apocalypse events occurring during our lifetime. As we watched his two children playing joyfully in his backyard he shifted his concern to what could substitute for his children’s current prescription drug Ritalin if and when the commercial product were to no longer be accessible. No one wants to deal with the symptoms of a cold during a disaster—actually during any time, now that I think of it. But being in close quarters with others will put you at increased risk. Even if you’re a loner, the natural stress of the situation is going to lower your immune system. So what can you do? Antibiotics won’t help. In fact, treating a cold is one of those times when natural solutions may be the only solution. The journal American Family Physician has a new article called “Treatment of the Common Cold in Children and Adults.” There’s still no cure, but this article cites proven methods to prevent colds and to shorten the course if you have one. Some things work better on children than adults and vice versa. Given that I run a prepping and self-sufficiency website, it came as a bit of a surprise when I cut my hand a while back and went to the first aid kit and there was no antibacterial cream… Luckily I survive the cut without the antibacterial, but it got me thinking. 100s and 1000s of years back, what were people using to clean and disinfect wounds? Sure, loads more people died from infection, but they still must have had some form of antibacterial ointment for wounds. This is when I stumbled on the fact that sugar is a very effective antibacterial and has been used for 1000s of years to treat open wounds and prevent/fight infect. I don’t think this is widely known, probably because big pharma can’t patent it and license it for medical use, but sugar’s antibacterial properties are proven. Here's some of the best home remedies for mosquito bites! There are a multitude of wart removal home remedies out there for you to try! Keep in mind that warts are typically caused by a virus that has invaded the skin and even though you won't get warts from toads or frogs they are contagious. If you sneeze and sniffle your way through pollen season, or experience hives, itching or swelling when you eat a certain food or get stung by an insect, then you’re no stranger to allergies. “An allergy starts when the immune system mistakes a normally harmless substance for a dangerous invader,” explains the Mayo Clinic. The most common types of allergies include food allergies, respiratory allergies, contact allergies and insect sting allergies. Sniffling noses, itchy eyes, watering eyes. It's allergy season. According to the American College of Allergy, Asthma and Immunology, allergies affect more than 50 million Americans. Seasonal allergies like hay fever are caused by pollen in trees, grasses, weeds and mold spores. People with a high sensitivity to these pollens are afflicted by symptoms that can be irritating and possibly debilitating. I have most of these ingredients, already! I love that the shelf life is FIVE YEARS! There are several OTC antiseptic ointments to choose from at the local market, which are normally applied directly to the wound. They are meant to prevent infection from developing. While these options often work and the products have some helpful ingredients, they also have some unnecessary ingredients, so they can be mass produced. Fortunately there is an alternative for those of you who choose to live a more natural life, without the unnecessary added ingredients to every day products. This isn’t about saving money, because to be honest, the ingredients are not necessarily inexpensive for the initial purchase. On the other hand they will last a very long time and make several batches of antiseptic. Or, you can share by making this for family and friends who also want to benefit from a purer approach to healing. A migraine isn’t touched by simple over-the-counter aspirin or pain reliever, and it isn’t always relieved by a prescribed medication either. Some people are looking for a different approach, such as a herbal remedy. The reasons vary, from wanting to go all natural to the preppers that want to have something on hand right when the first sign of a migraine appears. Regardless of your reason, the following information is a great alternative solution for an ancient problem. Pain Relief using tumeric, instead of OTC meds! If you watch the news on any given day, it doesn’t take long to realize there is an opioid addiction epidemic around the world. The use of it is on the rise, as well as the abuse from those using, prescribing, or those stealing and selling them. However, that doesn’t mean there isn’t real pain among the people using prescription drugs, in turn creating a real need for something to help relieve that pain. But, does that need mean that a person must succumb to the addictive characteristics of prescription narcotics? No. There many other natural alternatives to relieving pain. And, you can even make your own pain pills. This Natural Bug Repellent Is As Effective As DEET! 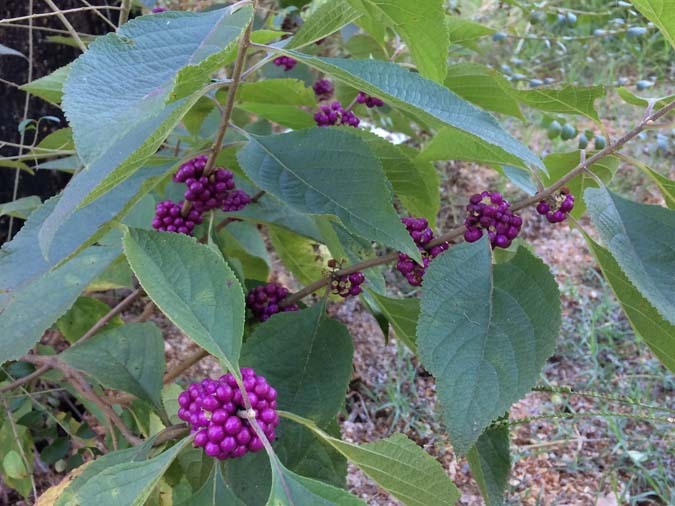 Beautyberry plants have long been used as a natural bug repellent to repel mosquitoes, biting flies, ticks, and other pests. Modern studies have validated this tradition, demonstrating compounds within the plant to be as effective as DEET.1) I often take a few leaves, crush them, and rub them on myself when I go into the woods. So when my wife complained about the mosquitoes eating her up each time she went out into the yard, my first thought was beautyberry. Beautiful to look at in full bloom, the sunny orange calendula – also known as marigold – has a wealth of herbal uses that are worth learning about. (SNIP) ... Through a combination of digging out lost skills and the radical availability of raw materials, people have begun to stock their own medicine cabinets. Even easy to buy OTC meds are being replaced by safer natural methods of dealing with pain, infection and healing in general. You might think this kind of work belongs in a lab, but you’d be mistaken. In fact, we are going to go over some of the medicines you should know how to make at home. At Common Sense Home, we've built an extensive natural medicine library, sharing what works for our families. REMEMBER – Always see a trained health care provider if symptoms are severe or last an unusually long time. The posts on the site are for information only. I share what works for us and our readers, as well as the latest research. » Home button near footer?